Be Ready Florida! Even if your area hasn’t been hit with a major hurricane in years, don’t let this be the year you slack off on your hurricane preparation. 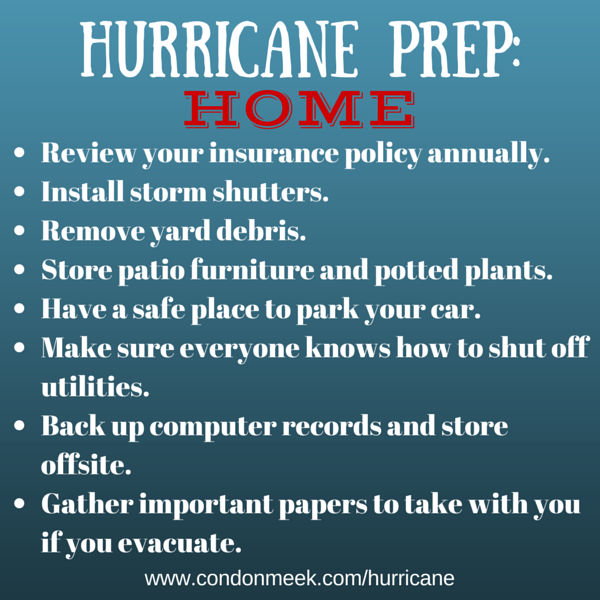 Condon-Meek Insurance wants to help you prepare for a hurricane, so in the unfortunate event of hurricane damage, or evacuation – you are better prepared to handle what comes your way. Print our Hurricane Preparedness Checklist and get started on your Emergency kit today. Respect what hurricanes can do – and know what your insurance covers. We’ve all seen the dramatic effect hurricanes can have – from both the initial wind and then the rain and floods that follow. Your insurance policy should cover repair or rebuilding costs of covered losses. If you can’t live in your home, you will need Additional Living Expenses (ALE) covered. Review your policy for detailed coverage explanations. You should review your insurance policies once a year to make sure you have enough coverage to rebuild based on current construction costs. We recommend you get a precise estimate and make sure you talk to your agent about your home’s unique features. Flood damage from hurricanes isn’t covered by property insurance. It’s important to know that home insurance does not cover flood damage from a hurricane. Your agent can help you purchase a flood insurance policy – please contact us today to discuss this. 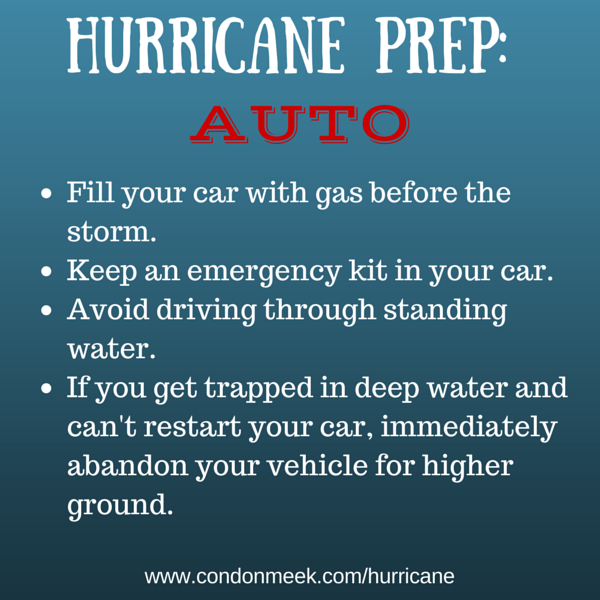 Reduce potential damage before a hurricane hits. Remove yard debris, like dead tree limbs, that could become flying objects. Have a safe place to park your cars or store your boat. Make sure you, your family or employees know how to shut off utilities. Back-up computer records and store them at least 50 miles off-site. Download these blank tracking charts for Hurricane Season. Why You Need a Weather Radio? It’s very likely that you will lose power when a hurricane hits your area and if that’s the case then you want to make sure to have access to a source of information that isn’t reliant on power to work. Weather radios are designed to receive the NOAA Weather Radio service’s broadcast with weather status and updates. You will receive 24-7 weather information. Weather radio’s are also designed to respond to the FCC’s Emergency Alert System. Check our our top picks for weather radios at our Amazon Store. Make sure to fill your car with gasoline before the storm arrives. Plan ahead for longer lines at the pump. Keep an emergency kit stocked in your car in the event of a breakdown. If you decided to evacuate your area and leave your vehicle behind, make sure it is not left in a low-lying area that is prone to flooding. When you are evacuating or returning to your home following the storm, keep an eye out for standing water in parking lots and streets. Avoid driving through standing water. Most cars can be swept away by as little as 12 inches of moving water. Find an alternate route. If you find no other alternate route and must drive through standing water, do your best to estimate the depth of the water. Roadways can collapse under water. If your car stalls in the deep water, you may need to restart the engine to make it to safety but know that restarting your car may cause irreversible damage to your engine. If you are unable to restart your vehicle and you become trapped in rising water, IMMEDIATELY ABANDON THE VEHICLE FOR HIGHER GROUND. If you are unable to get out of the car, call 911 or get the attention of a passerby or someone on higher ground. 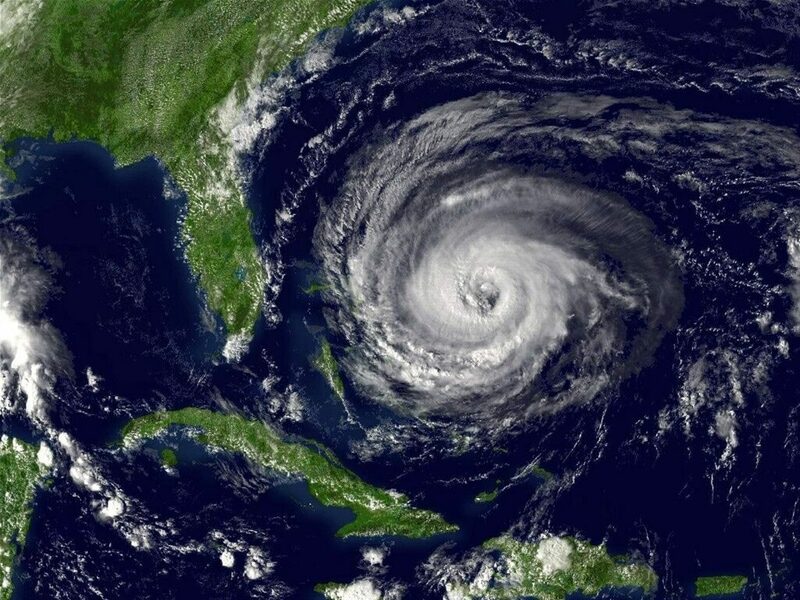 Do not wait until a storm is approaching to review your insurance policy, you will be unable to make changes to your policy once a storm enters “the box” that carriers draw in the Gulf and Atlantic. Homeowner’s insurance typically covers the cost to repair common hurricane damage, including damage to roofs and walls, cars and your personal belongings. Review your policy with you agent so you know exactly what will be covered. If you can’t live in your home, your insurance may help pay for additional living expenses as provided in your policy. 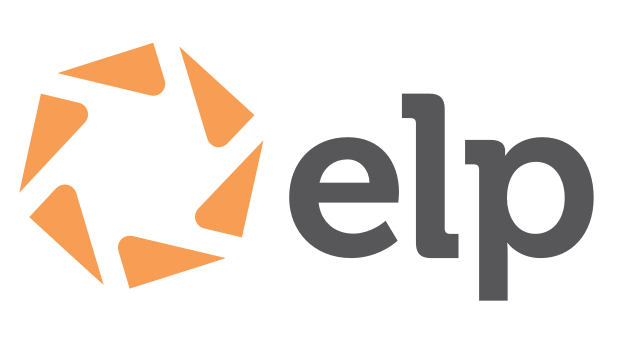 Review your policy for detailed coverage explanations. Review your insurance policy once a year to make sure you have enough coverage to rebuild based on current construction costs. Learn more about Market Cost vs. Cost to Rebuild. Work with an independent building contractor to get a precise estimate, and talk to your agent about your home’s unique features. Store patio furniture and potted plants. Have a safe place to park your cars and/or store your boat. 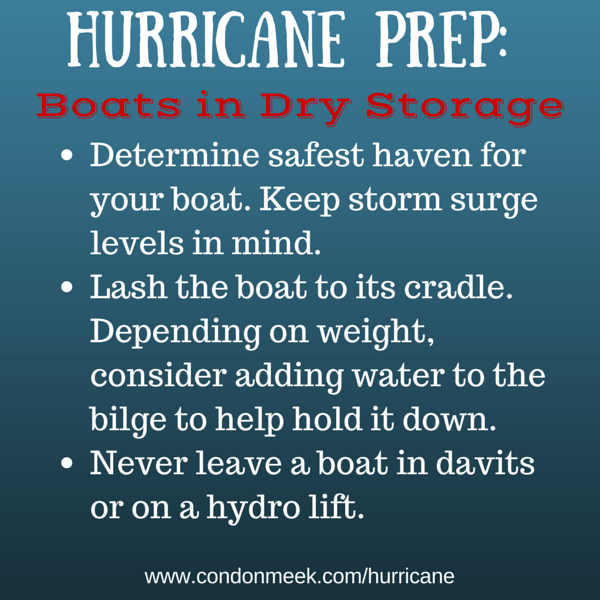 (read more about Hurricane Prep for boats below). Make sure you, your family, and/or your employees know how to shut off utilities. Gather important papers, including home inventory lists and insurance information to take with you if you must evacuate. Know your county’s evacuation plan and, if asked to evacuate, do so immediately. Watch out for snakes and animals that may have taken refuge in your home. Don’t run a generator or barbecue grill indoors. Hazardous fumes and carbon monoxide poisoning can be deadly. Don’t leave candles or a fireplace unattended, and keep the area well ventilated. If you evacuated, don’t return home until local authorities say it’s safe to do so. Check gas, electrical and sewage systems, and your chimney. If gas is leaking, turn it off at the main shut-off valve, leave the building immediately, and call a professional for service. Stay our of your home if it is severely damaged. Once it is safe to do so call us at 1-800-221-1964. If the authorities were contact, which department responded and what is the report number? What is your current contact information, if different than what we have on file? If you are able to, take photos of the damage. The photos can be very helpful during the claims process. 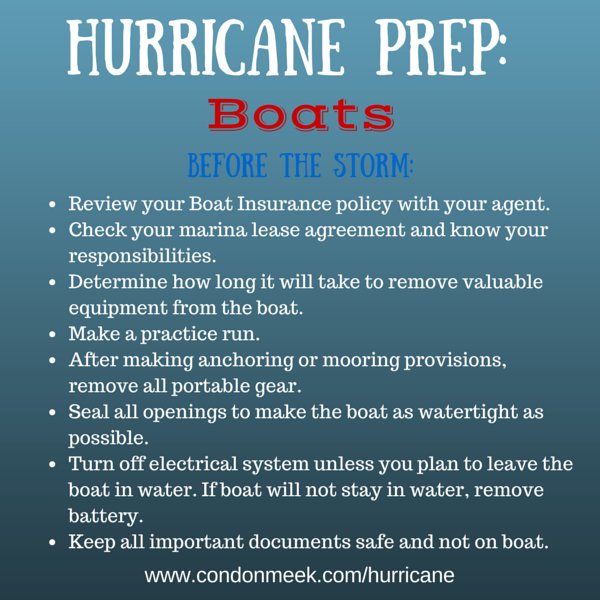 The key to protecting your boat from hurricanes or any severe weather is planning, preparation and timely action. Most of the work is done BEFORE the storm. Typically, you have from 12 to 24 hours to take action after bad weather is predicted or a hurricane warning is issued but the key is to HAVE A PLAN ahead of time. Review your Boat Insurance policy with your agent to make sure you have proper coverage. Make a list of the equipment and supplies you will need to carry out your plan. Arrange for a reliable person to carry out your plan if you are out of town during a storm. Make a practice run to check accessibility, depth of water, bridges, location of aids/or obstructions to navigation and locations to secure lines or drop anchors. Check to see if drawbridges will be open during evacuation time. After you have made anchoring or mooring provisions, remove all portable equipment: canvas, sails, dinghies, radios, cushions, Bimini tops etc. Tie down everything you cannot remove. Seal all openings to make the boat as watertight as possible. Turn off electrical system unless you plan to leave the boat in the water. If the boat is not going to remain in water, remove the battery to eliminate the risk of fire. Keep all documents, including insurance policies, a recent photo or video of the boat, registration, equipment inventory, lease agreement and telephone numbers of the harbor master, coast guard, insurance agent, national weather service, etc. Store these documents somewhere safe, other than your boat. Check the condition of your trailer tires, bearings and axle. Once at a safe place, lash your boat to the trailer and place blocks between the frame members and the axle inside wash wheel. Owners of lightweight boats may wish to consider letting out about half the air in each tire, then filling the boat one-third full of water to help hold it down. The blocks will prevent damage to the springs from the additional weight of the water. Consult with the manufacturer for the best procedure for securing your lightweight boat. 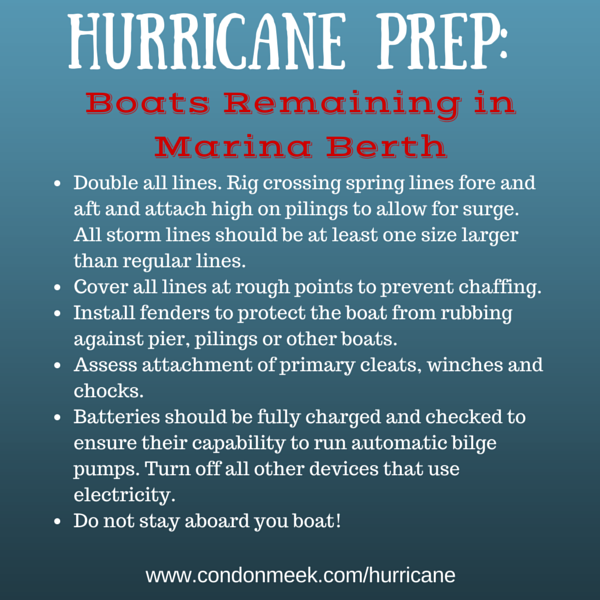 Wherever you choose to leave your boat for the duration of the storm, lash the boat to its cradle with heavy lines. Based on the weight of the boat, consider adding water to the bilge to help hold it down. If your plan calls for moving your watercraft, try to move it at least 48 to 72 hours before the hurricane or storm is estimated to strike the area. This may even be before a hurricane watch is issued. •Cockpit drains are clear and open. •Firefighting equipment is in good condition, in place and readily accessible. •Double all lines. Rig crossing spring lines fore and aft and attach high on pilings to allow for tidal rise or surge. Make sure lines will not slip off pilings. Inspect the pilings and choose those that seem the strongest and tallest. All storm lines used should be at least one size larger than regular lines. •Cover all lines at rough points to prevent chafing. Install fenders to protect the boat from rubbing against the pier, pilings and other boats. •Assess the attachment of primary cleats, winches and chocks. These should have substantial back plates and adequately sized stainless steel bolts. 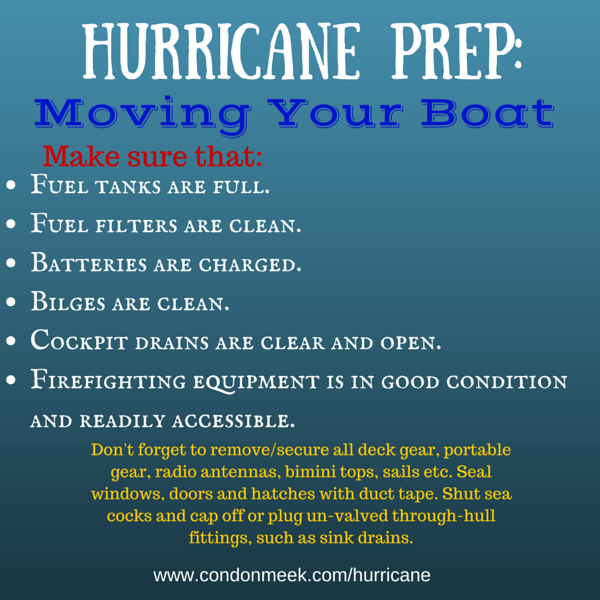 •Batteries should be fully charged and checked to ensure their capability to run automatic bilge pumps for the duration of the storm. Turn off all other devices that use electricity. •Do not stay aboard your boat! If you have storm damage, call us as soon as possible at 1-800-221-1964. IMPORTANT DISCLAIMER: This information brought to you by Condon-Meek Insurance, Progressive and SafeCo is for informational purposes only, please contact your agent directly to speak with them regarding any coverages or changes to your specific policies.